Information on this web page was first uploaded to the internet in January 2012. 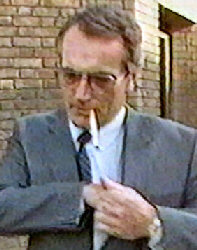 Julie Mugford had told the police that Jeremy hired a hit man to kill the family. She named a local man that she knew called Matthew McDonald and said she knew him to be a mercenary. The police interviewed him and found that he had a cast iron alibi for the night in question. Unsurprisingly the £2,000 that Mugford claimed Jeremy was paying to Matthew to carry out the killings was never traced. Julie Mugford’s ficticious account of the hit man candidly shows how she was prepared to make up stories to Jeremy’s detriment and in the wake of this further implicating another innocent man. One begins to wonder if Julie Mugford really intended that Jeremy should be charged with murder. Our opinion is that Mugford was a rejected, bitter young woman who cannot have thought for a minute that Jeremy was guilty of murder but once her claims gained momentum it snowballed out of control, she saw her opportunity for money and fame and readily accepted that option.